Ready for a Hilton Resorts Vacation? AND, Enjoy Personlized Service from a Caribbean Vacation Expert at no added cost! Simply fill out this form or call us at 1-888-447-8467 to speak to a vacation planner now. Hilton's all-inclusive resorts provide the perfect balance of a refreshing and fun-filled vacation with oceanfront locations in Jamaica, Mexico and the Dominican Republic. Guests can look forward to endless activities and luxurious amenities on-site, and optional excursions to nearby popular attractions, like some of the Caribbean's best golf courses and coral sites. Hilton offers adult-only and family resorts with accommodations, entertainment and atmospheres suitable for each type of traveler. For guests traveling as a family, adults can enjoy their getaway stress-free as there is unlimited entertainment for kids and teens. For those seeking an adult retreat, optional spa services and nightly entertainment await. All resorts offer exceptional service and authentic experiences, ensuring every guest feels refreshed and pampered. Rooms and suites vary by resort property, however most feature private balconies, a mini-bar restocked daily, plush Hilton bedding, turndown service, and 24-hour room service. Guests can enjoy exceptional dishes and dining venues inspired from their destination, unique fusions, grill classics and comfort food. All dining is unlimited and included. Most of the Hilton Resorts provide premium and top shelf wines and liquors and each property offers unique bars including Coffee Bars, Juice Bars and Pool Bars. All resorts offer endless drinks, pool and beach service. Guests can participate in cooking demonstrations and tastings to learn more about the culture of their destination, watch live entertainment or go to any of the themed parties. Select resorts offer complimentary celebration packages for weddings, but all resorts offer packages for weddings, honeymoons, anniversaries, conferences and group events. For more details, you can ask your dedicated travel agent. At the all-inclusive family resorts, kids and teens can participate in fun activities while parents can enjoy free time, at no additional charge at the Kids and Teens Club. Each resort offers multiple pools and whirlpools, swim- up bars and non-motorized watersports like snorkeling and kayaking. For guests that like to continue an active lifestyle, they can participate in any of the many fitness classes like aerobics and Zumba, or use the free weights and machines in the Fitness Center. Wi-Fi is complimentary and accessible resort-wide, so guests can stay connected during their stay. For more detailed information, contact your Vacation Planner today! Interested In Hilton Resorts Resorts? 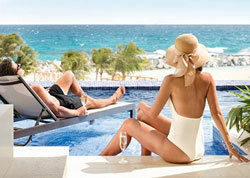 Interested In A Hilton Resorts Vacation? Simply fill out this form to speak to a vacation planner or call us now at 1-888-447-8467.